While the fitness industry’s economy is primarily driven by those who wish to lose fat, and those who wish to add muscle size, there are also those who train for general health and well being. These are men and women who love to train, because they love the rush of endorphins following a workout, love to live pain free and disease free, feel good about making progress with their strength and fitness levels, etc. Sure, they might like to lose another 5 pounds or maybe gain 5 pounds, but that does not drive their training or dictate their mindset, because they are in pretty good shape, even if not perfect. 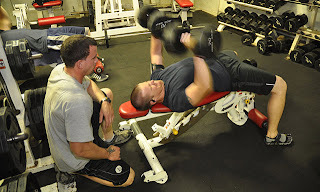 Intense strength training to build strength and build/maintain muscle. While in the 80’s we were told how doing only cardio is sufficient and the be all and end all for fitness, in reality overall fitness requires a lot more than that. And strength training is an important part of it. Without muscular strength your chances of injuries in day to day activities are greater, and simple activties tire you faster as will be weak. Plus , lets not forget about joint and bone health and density, which is maintained by regular strength training. Intense cardio for conditioning. Even though the benefits of cardio training is at times exaggerated, it cannot be denied that for overall health purposes, some amount of cardio training is a must. Having said that, it does not have to be long, slow and painfully boring cardio, you have a lot more interesting options that require much lesser time. Good examples being bodyweight finishers, kettlebell swings, etc. Maintaining ideal body composition. Even though you maybe in decent shape right now, making sure that you do not get out of shape, ever, should be kept in mind. For this of course your diet will play a vital role too, as will keeping stress levels in check. Having good joint mobility and being flexible. As you age, your joint mobility and flexibilty will tend to decrease, that is unless you do the required exercises to maintain good flexibility and mobility, and maybe even improve upon it. As long as you keep overall fitness and well being in check, you will really enjoy the fitness lifestyle, even if you never compete in an athletic event, ever. And if you ever go from being fit to unfit, believe me, you will immediately know what you are missing, as you will feel pathetic and miserable! In this post I would like to discuss specifically about strength training for the general fitness enthusiast. As mentioned before, the general fitness enthusiast does not train to compete in any sport, but does so for personal well being. And as far as I know, the overall number of general fitness enthusiasts who strength train, is far higher than competitive strength athletes like powerlifters, Olympic weightlifters, and bodybuiders. But, trying to train like a pro is not always the best idea if you do not have their genetics and lifestyle. So read on to find out about how you should train if you happen to be into strength training for general fitness. 1) Do compound exercises primarily- while this point has made many times by top strength coaches around the world, it still remains one of the most important lessons that you can learn. Exercises like squats, rows, military presses will give you a lot more bang for your buck than what isolation work like crunches, leg extensions will ever give you. This is not to say that you should never do any isolation exercise, but just that keep the compound work the main focus and the majority of your workout. 2) Modify exercises where needed- you will not be tested on deadlifts, squats, Olympic lifts, etc and neither does your career depend on doing so. And since staying strong and inury free is your goal, you might need to do modified versions of some classic exercises. For eg if you do not have great mobility, then you may want to do deadlifts from a rack instead off from the floor, similarly squatting to parrallel might be safer for you to stick to rather than going any lower. Of course you can overtime work to doing these with the full range of motion as your mobilty and strength improves, but till then stay safe. 3) Avoid pushing to failure all the time- while most professional athletes work very hard, it is a myth that they train till they drop. Yes, you will need to push yourself, but trying to kill yourself at every workout, will only help to make you feel worse and cut back on progress. Instead of trying to feel that a truck ranover you after a workout, focus on working hard and stopping a rep or two short of failure. After all, considering that you got to go to office/look after your home and do other such work outside the gym, it will not feel too good if you have to drag your sore legs all the time since your workouts always make you too sore. Also be sure to focus on developing strength, rather than testing it all the time. 4) Train in the 5-12 rep range- going too heavy and doing single, double or triple reps is very challenging, and you need to have good technique to be able to avoid any injury. Also such heavy weights done often can be very stressful on your joints. On the other hand doing nothing but high reps with light weights is not really going to stimualte strength gains, and if overdone, then the isolation exercises can cause overuse injuries too. So the ideal range in my opinion for general fitness enthusiasts is the 5-12 reps range. This rep range helps you to go heavy enough for gains, without hurting yourself. And yes, you should use the whole rep range, meaning do some exercises in the lower end like 5-7, some in the mid range (8-10 reps) and some in the higher end (11-12). This way you will stimulate the different muscle fibers for best benefits. 5) Make progress gradually- it’s a very common sight in a gym to see a skinny guy with poor muscular develoment trying to lift weights beyond his strength levels. And the results is, people laughing behind his back, and accepting being in pain all the time as a way of living. If you wish to avoid becoming like one of these gym clowns, then be patient when trying to make progress. In the first few months of training you will be able to add weight pretty rapidly, but thereafter it might take you 3-4 weeks before you can add a few pounds, and for the more advanced trainess it may take months before you can add more weight to the bar. However, listening to your body always works in your favor in the long term, so be patient. 6) Take deload weeks- while you may not be able to deadlift like Konstantin Konstantinov, your body still needs some back off weeks to be able to heal itself and keep progressing. No, don’t worry taking the scheduled deload weeks will not make you weak. On the other hand you are likely to come back stronger since you would be fresher and the odd niggle here and there will be gone. So how often should you take a deload week? In my opinion taking one every 4-8 weeks is a good idea. The more advanced you are the more frequently you need to deload, and the newer you are to strength training, the longer you can wait to take a deload week. And during these weeks cut back to lifting about 60% of the weights that you normally use. Continuing on the topic of taking deload weeks, some people will find that taking completely off from any training for 7-15 days once every 6-12 months works very well for them. This mini “layoff” helps to refresh the body as well as the mind, and makes you come back to the gym with greater intensity for better gains. So even though you are not looking to compete in any strength event, don’t let your training become unstructured and dangerous. Instead utilize these time tested rules that will make your training journey a pleasure, and one that helps to enhance the quality of your life.